In the month of June, there have been a couple of incidents take place that have been glossed over with humor but have a serious undertone. On Sunday June 3, GM executive Mark Reuss crashed the IndyCar Pace Car at Belle Isle just after leaving the pits as he was about to lead the twenty-four cars to the green flag for the second of two races in the Chevrolet Grand Prix of Detroit. It was a hard hit but Reuss and his passenger, IndyCar official Mark Sandy, walked away shaken but uninjured. One week later at the Formula One Canadian Grand Prix in Montreal, Canadian supermodel Winnie Harlow was given the ceremonial task of waving the checkered flag as Sebastian Vettel crossed the line on the final lap. The problem was, the race was scheduled to run for seventy laps. Harlow waved the checkered flag at the end of Lap 69 – one lap early. In all fairness, Winnie Harlow was not to blame. She was only following directions. Someone across the track from her in Race Control told her to wave it. She only did what she was told. It made no difference, mind you. It just accelerated the inevitable. Vettel led every lap and would have led until the sun went down. These are different examples that led to a few jokes, but had no dire consequences. But I think they both serve as a warning for the potential for dangers that needlessly exist just so celebrities and/or sponsors can have involvement in real-time racing. Think about it. Tell me another sport that allows celebrities or non-participants to get involved when a sporting event is live and taking place. I can’t think of one. In baseball, celebrities will throw out the ceremonial first pitch. The key word there is ceremonial. It’s a pitch before the game actually starts. There is no batter standing there waiting to smack the ball back at a defenseless celebrity that, more than likely, one-hopped the ball over the plate. There is often a ceremonial face-off at hockey games, but no one crosschecks the celebrity that drops the puck. Generally, the player from the home team makes a gentle swipe at the puck, then reaches down and hands it to the celebrity. At NFL games, a local kid is sometimes chosen to run out and get the tee after the whistle has blown after the kickoff. But no players attempt to tackle the kid as he or she is retrieving the tee. None of these non-participants are ever put in harms way, nor can their presence ever have any type of impact on the game or event. But in racing; celebrities, dignitaries and sponsor executives are given active roles in live events. Non-qualified drivers are allowed to pace the field to start the race on various tracks. In the case of Mark Reuss, he actually was a qualified driver. He just got unlucky. But do we really think that Victor Oladipo, Guy Fieri, Robin Roberts, Josh Duhamel or Elaine Irwin-Mellencamp are qualified to bring down the field at Indianapolis at speeds well over 100 mph and have something go wrong? Bobby Unser hit a dove on the backstretch in the early seventies, just to give one example as something unexpected that could go wrong. On at least two occasions that I know of just this past May, track activity had to be halted due to the presence of a goose on the pit lane access roads. It’s not uncommon for rodents or small animals to run out onto the track – and this is just at Indianapolis. There are fifteen other venues on the schedule this season. During a testing incident, Christiano da Matta hit a deer on the track at Road America in 2002. Would an executive from Kohler driving a 700 hp Corvette be able to handle a surprise like that? And what about those charged with waving the green flag at races? IndyCar doesn’t have celebrities waving the checkered flag like Formula One does, but waving the green flag could prove to be even more problematic. For about the last fifteen years, Honorary Starters have been utilized to wave the green flag at the start of the Indianapolis 500. There have been notable names like Peyton Manning, Jack Nicholson, Reggie Miller, Sugar Ray Leonard and Patrick Dempsey and less notables like Allen Sirkin, COO of Philips Van Heusen (parent company to IZOD), Michael Peña and Chris Pine. This year’s starter was Chris Hemsworth; who many relate to as Thor, but he’ll always be James Hunt in Rush, to me. Let’s pick on Hemsworth and use him as an example since he’s the most recent Honorary Starter at the Indianapolis 500 – and one of the few of the recent ones whose name I actually recognize. What would happen if that green flag actually slipped out of his hand and onto the track? It’s an old joke that the only advice to give the starter is not to drop the flag, but what if it actually happened? The results would not be a joking matter. There is nothing as thrilling or as terrifying as the start of the Indianapolis 500. Just imagine a pack of thirty-three cars screaming towards the green flag at the start of a race. It’s intimidating in normal circumstances. Imagine compounding it with an object falling out of the sky. Visions of the start of the 1966 race come to mind. The drivers in that race were all very lucky and people laugh about that today. With today’s speeds, a melee on the start may not be injury-free as it was over fifty years ago. These flags are not light, nor are they small. I’ve held one before. They are attached to solid wooden poles, probably 28 to 30 inches long and maybe an inch and a half in diameter. I don’t even want to think about what might happen if a driver got hit in the head by a flag handle at that speed. If that did happen, imagine the pile-up on the main straightaway that would take place behind that driver. If a dropped flag happen to miss a driver or even a car and managed to get all the way to the track, what might happen if a car ran over it? Would the car lose control. Even if a car hitting the flag maintained control, chances are good that it would be thrown into another car or into the stands. I have always felt that the potential for something bad happening, far outweighed whatever benefit was gained by having a non-participant handle duties that are normally done by professionals. In the interest of full disclosure and shameless self-promotion, I have been the personal beneficiary of this practice of allowing normal people do these jobs as a perk. 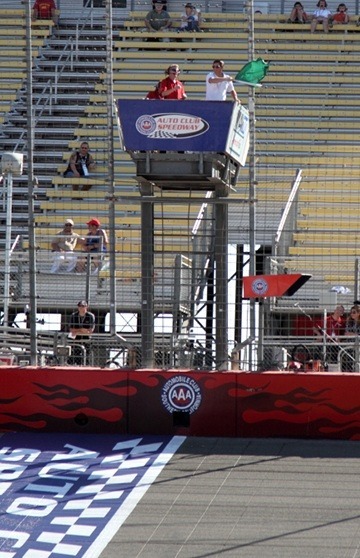 When we went to Fontana for the season-finale in 2013, some very good friends who were hefty sponsors at the time (and who still choose to remain nameless) offered me the opportunity to wave all three flags (green, white and checkered) for Helio Castroneves on his qualifying run, because they knew I was a big Helio fan. Who would turn down something like that? I have to say, it was a surreal experience – being in the flag stand over the track when the car is going directly below you. The rush of air that comes through the grated floor as the car passes underneath is impressive, to say the least. Altogether, that was a span of less than five minutes that I’ll never forget and I realize how lucky I am to have gotten to experience something like that. But does it mean that it’s OK to let people like you and me do things like that? No. The memory of Eldon Palmer has resurfaced in the last few weeks for all the wrong reasons. For those that don’t know, Palmer was a local Indianapolis-area Dodge dealer that was chosen to drive the Pace Car for the 1971 Indianapolis 500. Being a novice, he was under the mistaken impression that he had to cross the starting line in the pits, ahead of the cars at the start of the race. Prior to the race, he had placed an orange cone in the pits to mark his braking point. Somewhere in the course of the pre-race confusion, someone removed his cone. The result was that he came to the end of the pits going way too fast. As he was approaching the mobile photographer’s stand that had been pulled out to the end of the pits, he veered to the left and slid sideways into the stand. Luckily, no one was killed but twenty-nine people were injured – a few suffered serious and permanent injuries. Tony Hulman, one of the passengers, sprained his ankle. Chris Schenkel, from the ABC broadcast, was so shaken up he did not return for the remainder of the broadcast. Donald Davidson goes to great lengths to defend Eldon Palmer whenever a caller asks about him and it is predictably one of those subjects that Donald would prefer to avoid. But it serves as a lesson forty-seven years later of what can go wrong when an unqualified non-professional is given a key role in an event that is dangerous in nature. Again, that’s why no other sport has everyday people taking part in activities once the event has actually started. I’m not sure who tunes in to a race simply because Robin Roberts or Jim Harbaugh is driving the Pace Car; or that Peyton Manning is waving the green flag at the start. Does it really add any new viewers at all? Let celebrities prowl along the red carpet. Let them sing in the pre-race ceremonies and even pick one lucky celebrity to ride in the IndyCar two-seater just before the start of the race. But leave the Pace Car duties to Sarah Fisher, Oriol Servia or whoever is on-hand; and make sure that Starter Paul Blevin waves every flag at every race weekend. Otherwise, one of these comical occurrences involving celebrities and non-participants may end up with having dire consequences for IndyCar and/or their drivers. This entry was posted on June 20, 2018 at 4:02 am and is filed under IndyCar. You can follow any responses to this entry through the RSS 2.0 feed. You can leave a response, or trackback from your own site. Seems like they could easily rig up some kind of wrist tether on the flag that would ensure it doesn’t fall to the track if the celebrity waver drops it. Or just tether it to the flag stand itself. But I agree that giving celebrities these duties likely does very little to increase attendance or viewers. 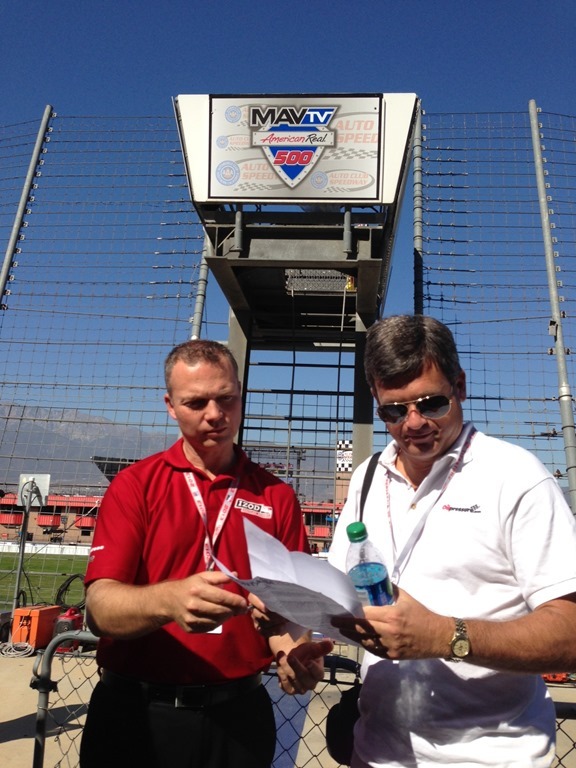 Indycar doesn’t mess around with starts, restarts or finishes….just ask Tom. with. You were taught by the best. There is also another factor, at least for the flag waving. This will sound petty to many and it’s not like I choose dislike it. At the start of the race when you feel your excitement level starting and you get this lame flag wave in Indycar or NASCAR it sort of blunts some of the excitement. A small thing but still it looks really bad most of the time. The flag even wraps up sometimes so it’s like a coloured stick going back and forth. I don’t see how it adds to the spectacle although the Formula 1 incident was a bit funny at the time. Glad it didn’t affect the outcome. Agreed. Pat Vidan handled the duties at Indy in my youth and always always ALWAYS made it look impressive. It’s even MORE impressive when you realize that he was doing it at track level, before the starter stand was built. I have watched a lot of racing over the years and seen a flag dropped twice and a checkered flag displayed improperly once. All times the mistake was made by professionals, and they are very rare mistakes. I don’t struggle with celebrity participation in flag or pace car duties, provided they are properly-trained. I think Indycar does that well. And in fairness to Eldon Palmer, driving the pace car fairly fast down pit road in an effort to keep up with the field at start-finish was common practice in the years prior to the 1971 500. Some say this was to prevent a collision with the pace car in case a racer pulled off the track at the start. Others claim it was because it looked good on photo/video, which pleased the sponsoring car manufacturer. Palmer’s speed on pit lane was not likely unprecedented, and if it was, it wasn’t by all that much. People voting to eliminate one or both, do you realize that a celeb’s appearance could bring some fresh eyes to the sport. Maybe not many but anyone new tuning in is what Indycar needs! I’m OK with celebs riding shotgun, while a professional driver is behind the wheel; when I first heard about celebs driving a pace car, I was a bit taken aback. I’m OK with celebs waving flags for everything BUT the race, and only if the flag stand isn’t over, or even close to, where a car is running. Also, who wants to see a flaccid green, white, and checkered flag wave, at a race? Leave it to the professionals. I sit in the NW Vista at the 500. This year I noticed Mario actually caught up to the last row and really had to slow down. He came up high and was actually next to the outside of row 11. Was this miscommunication with the 2 seater on where the field was? The field coming down slower? The 2 seater going faster? I thought to myself what a disaster that would be. I don’t care about the green flag, but let professional drivers take care of the Pace Car.